With limited mobility Linda Maynard has struggled with her bathroom for several years being unable to get in and out of the bath. Having felt what should be a simple task was becoming dangerous, for the past four years Linda had resorted to using the sink to wash.
After seeking advice from their Local Authority, Linda received a disabled facilities grant to adapt her bathroom into a wet room. The adaptation included providing a more suitable raised height toilet and fold up rail for extra support. 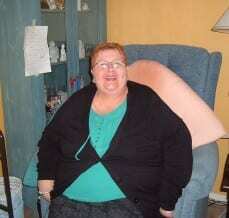 In addition AKW’s extra wide shower seat was also installed allowing Linda to shower in more comfort. This new bathroom has given Linda much needed independence and has undoubtedly improved things, for instance the barrier of simply entering the bathroom without her husband’s help has now been removed. Linda commented, “Since having my new complete wet room it has been 100% better than what we had before. The extra space makes it much easier and safer and I now do not have to rely on my husband as much. 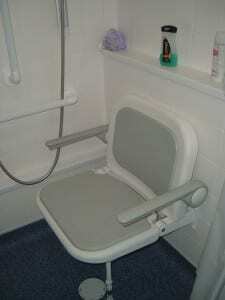 The shower seat is brilliant and the grab rails especially are too as they are really strong and give me more security. It really has been great for both me and my husband”.